This is back-pocket dip, for sure. Not literally, silly! Not as in back pocket … squish … ewwwwwww. But more like, this is one of those recipes that you’ll always want to have around, ready and waiting any old time. For one thing, it’s just so super quick and easy. 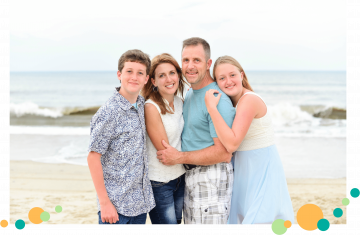 5 minutes – no exaggeration! 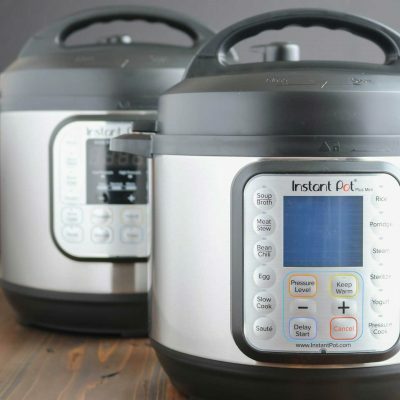 I also specifically designed it to use dried herbs and spices, so you have most of what you need on hand year round – without reaching for those packet mixes filled with weird preservatives, or having to buy several little containers of fresh herbs just to snip a half teaspoonful. 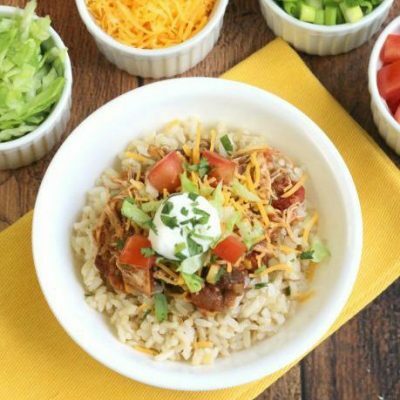 Plus, it’s low-guilt, with no mayo or full-fat sour cream anywhere in sight. 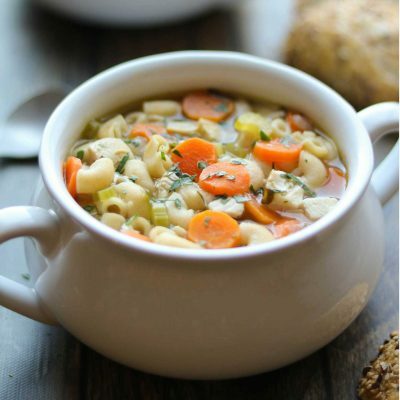 It’s totally happy joining you for a late-night nosh session (in which you will feel abundantly snacky-satisfied but also nutritiously virtuous – yay). But it’s also delighted to be dressed up for special occasions. 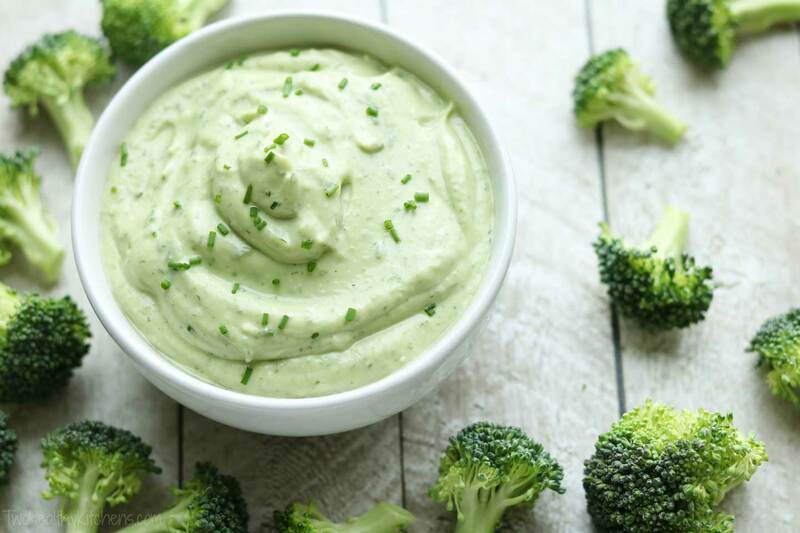 Just like our beloved Edamame Hummus, this Avocado Ranch Dip has a lovely green hue that makes it perfect for lots of holidays. Christmas? Yup! Surround it with red bell peppers, tiny red tomatoes, and plenty of green veggies, and you’ve got yourself a festive crudité platter in no time flat. High-five! St. Patrick’s Day? Easy! 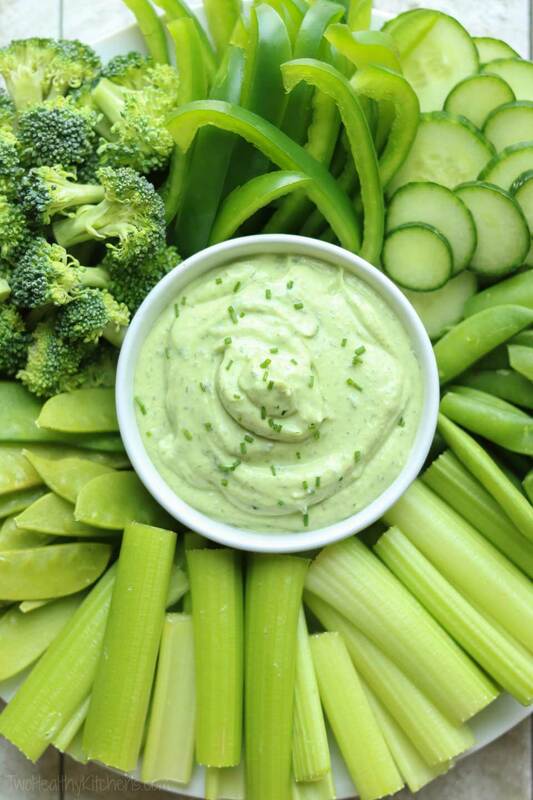 Just ditch those red veggies and stick with green. The luck-o-the-Irish is yours, my friend. 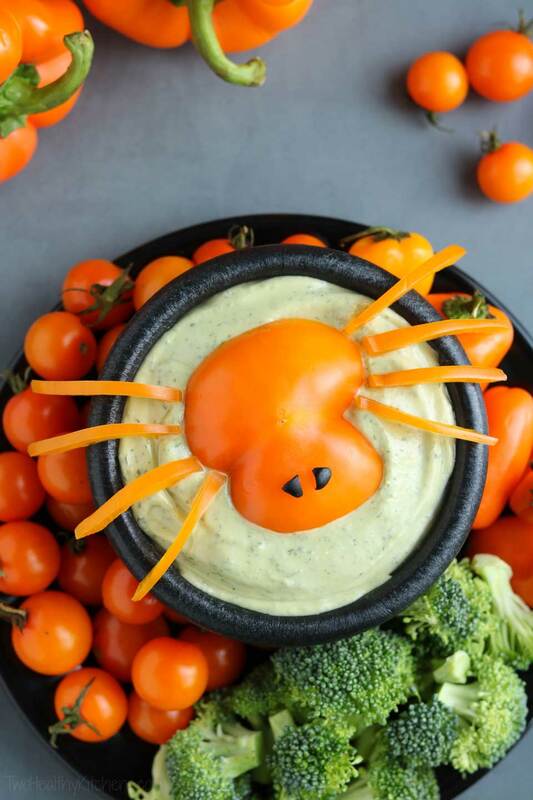 And you might remember how adorable this dip was for Halloween, topped with our spook-tacular Spider. Scary good. 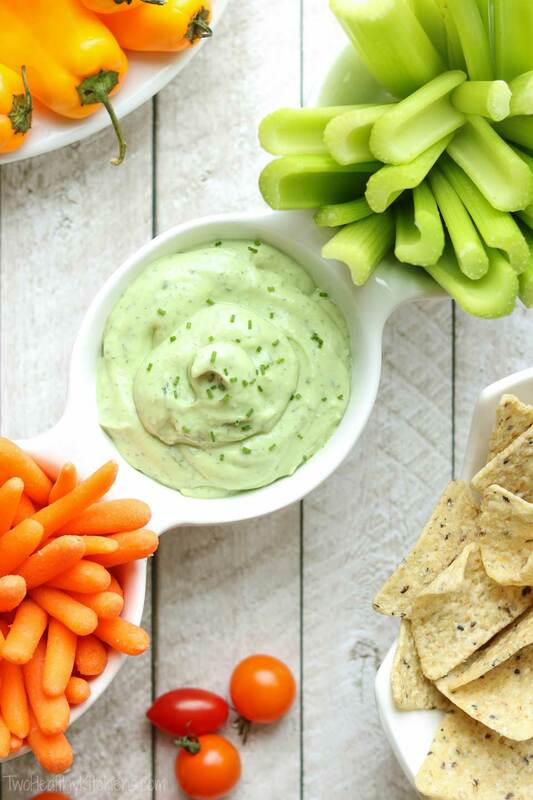 So, clearly this ranch dip is chummy with veggies – a fresh take on those tubs of gloppy store-bought ranch dips that seem to show up (boringly) on every veggie tray ever. And, it’s delicious (like full-on, maximally yummy) with whole-grain tortilla chips. Total game day noshing will happen. And late-night munching. Just … lots and lots of munching. This will disappear. I’ve watched it happen. It may seem a bit awkward, how I specify 2/3 cup mashed avocado in the recipe card’s directions, instead of just saying 1 avocado (which would be simpler, right?). But, depending on the season, avocados can vary quite a bit in size. 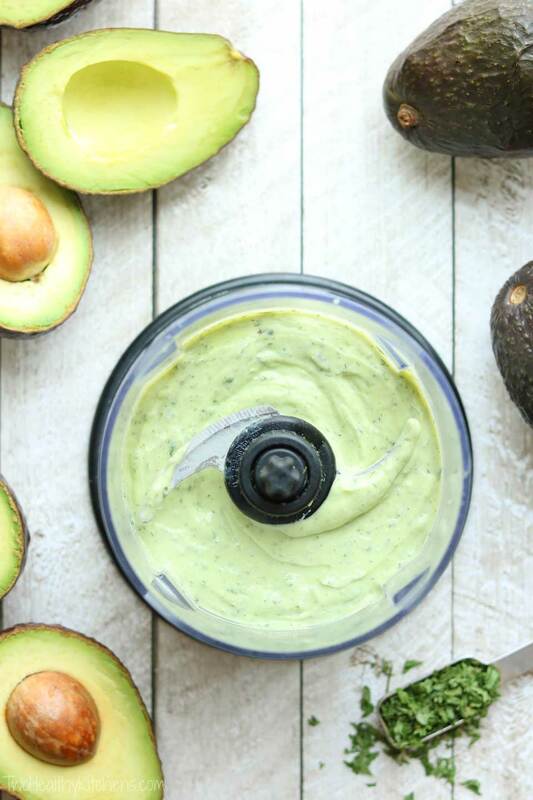 So, I wanted to start you off with a precise measurement, to help you get the balance of creamy avocado and ranchy-spices that my family liked best in testing. But hey – you can definitely wing it. The great thing about a dip like this is that you can whir it all up, and then give it a little taste to see if you want to adjust the flavors. A pinch more salt? Ok. Love dill? Add some more – you do you. Just be careful not to eat the whole batch from your fingers, “testing” it before you even get it dumped into the serving bowl. Although, on second thought – who am I to judge? Now, I’m guessing most of you have wrangled at least an avocado or two before this. I mean … avocado toast … everyone needs that in their life. Plus guac. Must have guac. But just in case you’ve never come face to face with an avocado in your own little knife-wielding showdown … in case you’re peering at that bumpity green-and-black avocado exterior, wondering how so much life-changing, creamy avocado goodness can come out of such a horrid-looking skin … never fear! Just peek at our post on How to Pit an Avocado. Everything you need to know (and more). 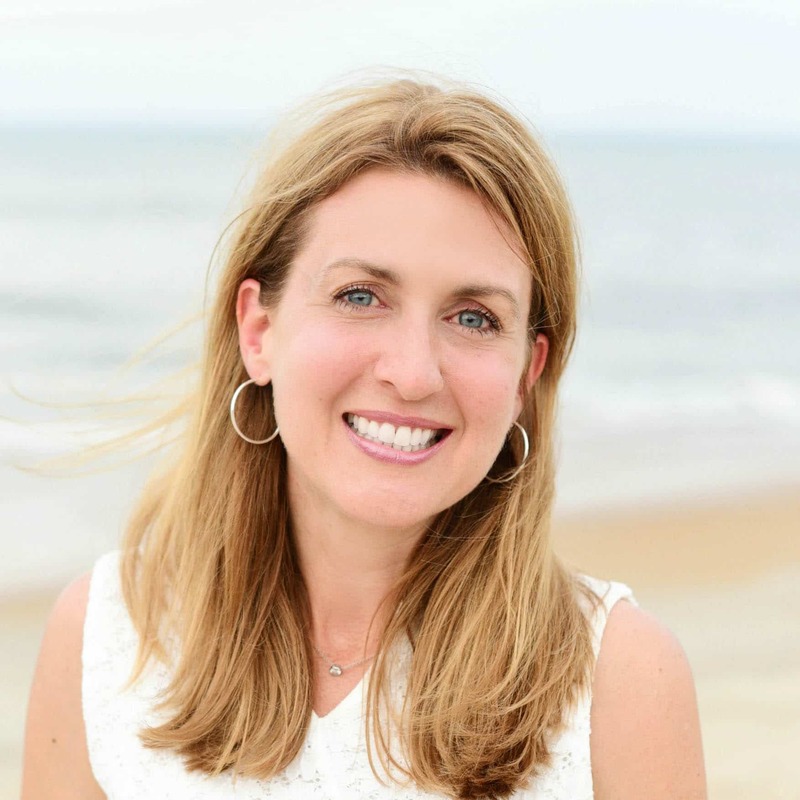 My bestie Gretchen (you remember her – she co-founded this web site!) gave me my current set of three Ninja processors years ago, and I use them all the time. 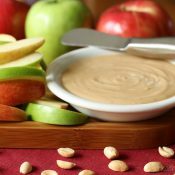 The big size is for smoothies, of course, but I adore the smallest one for making this ranch dip, as well as for mixing up all our various hummus recipes and making nut butters for cookie bars and Snack Bites. It’s just the right size! Plenty of other processor options to get the job done, though – use what you’ve got and what works for you! I know, I know – I’m the queen of make-ahead recipes. I look for every make-ahead step or shortcut I can. 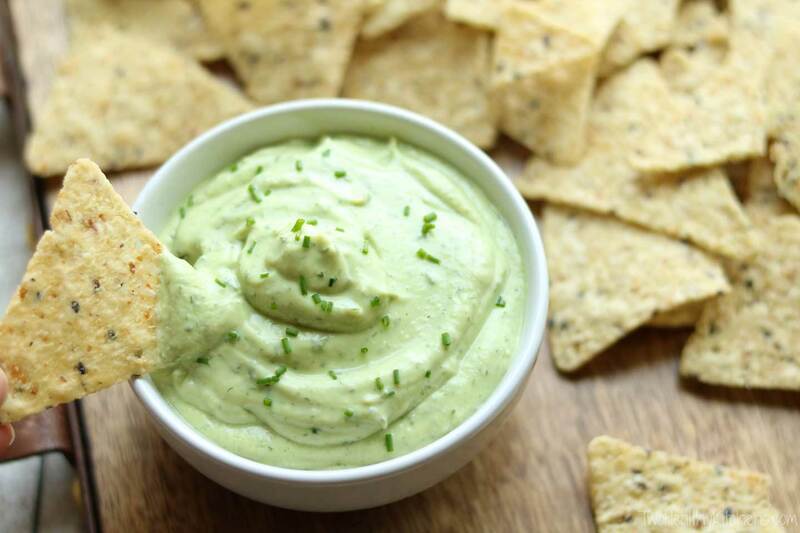 But this dip is really at its best served right away, not made the day before. Although the acidity from the vinegar does help a bit to keep the avocado from oxidizing (aka turning brownish-gray and tasting a little less yum), that oxidation does still happen, just a little more slowly. And then the dip just doesn’t taste as great. If you do want to make it a bit ahead, or if you somehow happen to have a little left over (although … who are we kidding? 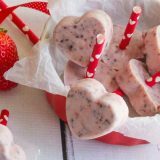 … you’ll grab a spoon and sneak the leftovers for yourself before they ever make it into your fridge, trust me! 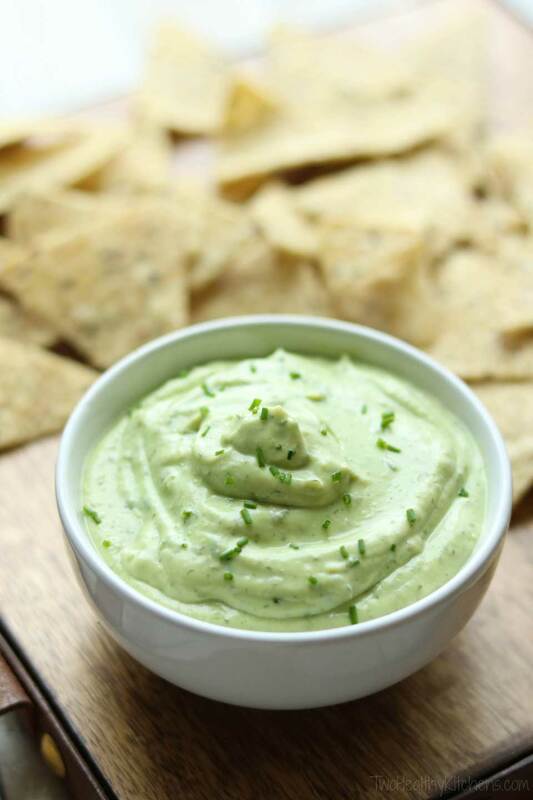 ), the best thing to do (as with most guacamoles or avocado-based dips) is to press plastic wrap directly onto the surface of the dip. This prevents the dip from coming into contact with the air, and will slow the browning. And … if you do pull the leftovers out of your fridge and see that the top looks less pretty-fresh-green, just run a spoon across the surface to scoop away the top, brownish layer. Then commence the noshing as usual. Okey doke – got it in your back pocket? Then you’re ready to spruce up any veggie tray that may come your way. And you’re all set for game day, and late-night fridge raids, too. If you’ve got an avocado, you’re pretty much good to go. Enjoy! Place all ingredients (except optional chive garnish) in a food processor and process until thoroughly combined, scraping down the sides as needed. Taste and adjust salt if desired (see note). 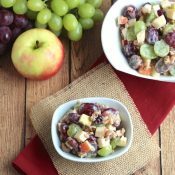 Serve immediately, alongside vegetables or whole-grain tortilla chips. 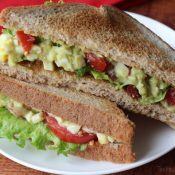 Avocado: There's actually no need to mash the avocado before processing, except that it will help you make sure you get exactly the right amount. Avocados vary in size, which could affect the ratio of the other ingredients you'd need in order to get the right flavor profile. 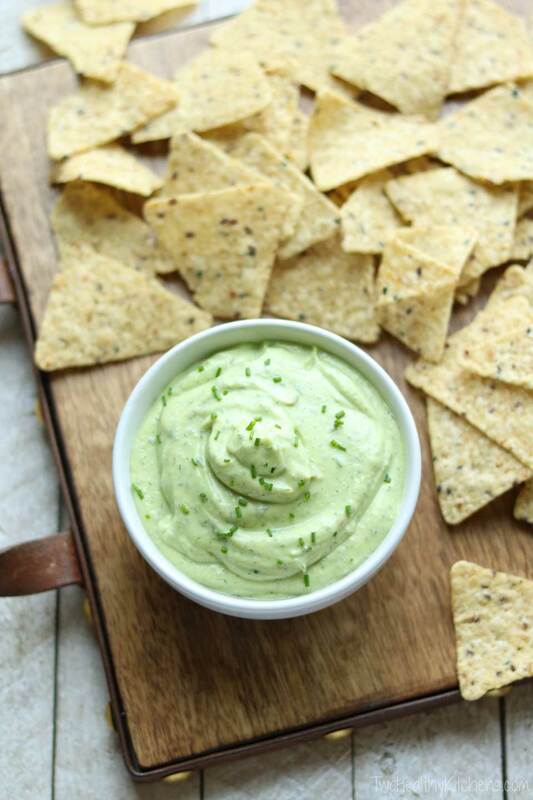 Salt: I typically adjust the amount of salt slightly, depending on whether I'm serving this Ranch Dip with vegetables, or with salty tortilla chips. 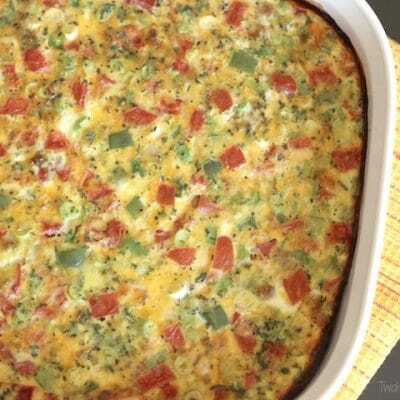 If serving with veggies, you may like to add slightly more salt, to help the flavors pop, but since tortilla chips are salty already, you probably can get by with less salt in the dip in that case. I recommend starting with 1/2 teaspoon of salt, and tasting the dip along with your choice of dipper – then adding a little additional salt if needed. This dip recipe was very loosely inspired by a recipe I saw in a 2015 issue of Rachael Ray Every Day, for Eat-Your-Greens Burgers. It involved an avocado ranch dressing, which I thought was a brilliant idea. But hers included quite a bit of full-fat sour cream, hot sauce, lemon juice, and various fresh herbs. 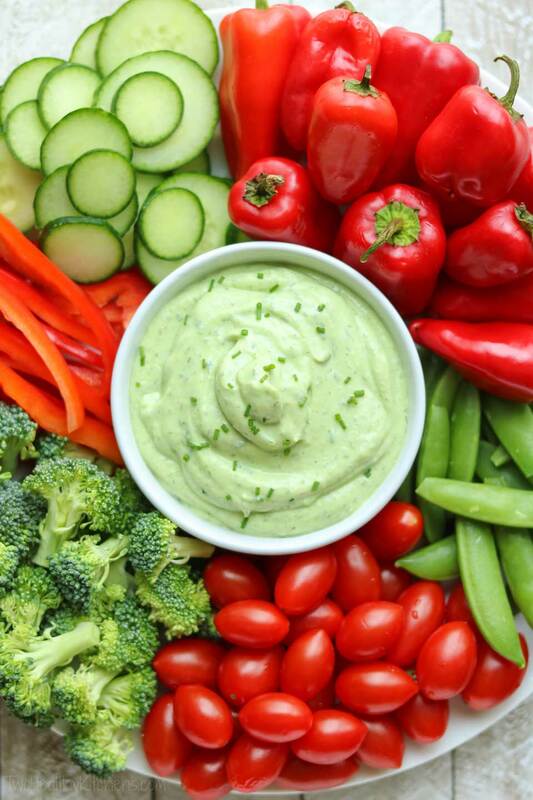 I thought I could adapt her idea into a healthier – and quicker – salad dressing, and as I’ve made it over the years, it actually turned into this yummy dip. I am wanting to make this for a super bowl party. If I make it tonight will the dip turn brown since there’s avocado in it? 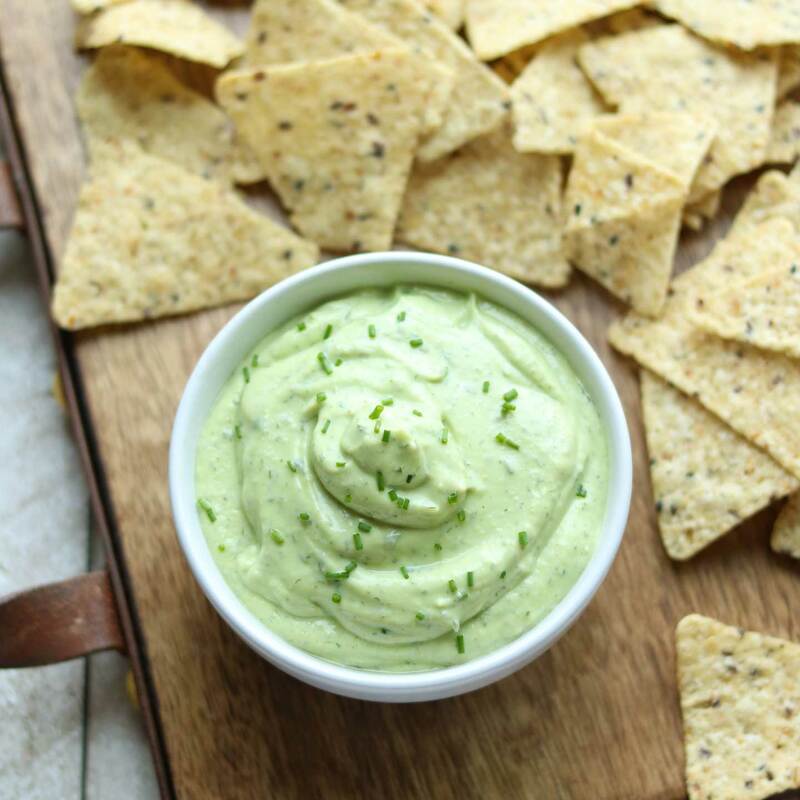 So, what we suggest, if you do want to make this dip a little bit ahead, is to use the trick you’d typically use with most other guacamoles or avocado dips … press plastic wrap directly on the surface of the dip before refrigerating. This helps to prevent the dip from coming into contact with the air, which should slow the browning some. Then, when you’re ready to serve it, if you see that the top looks less pretty-fresh-green, just run a spoon across the surface to scoop away the top, brownish layer.